Jays in the House: Could the 2018 New York Yankees be the greatest baseball team of all time? Could the 2018 New York Yankees be the greatest baseball team of all time? As usual, the New York Yankees are trying to buy their way to another championship. Rumor has it that Yankees owner George Steinbrenner Jr. hates losing. This rumor is supported by the decision to fire manager Joe Girardi days after the Yankees lost game 7 to the eventual World Series Champs Houston Astros. Their biggest off-season move thus far was trading for NL MVP Gioncarlo Stanton. Could the Yankees become the best regular season team ever? 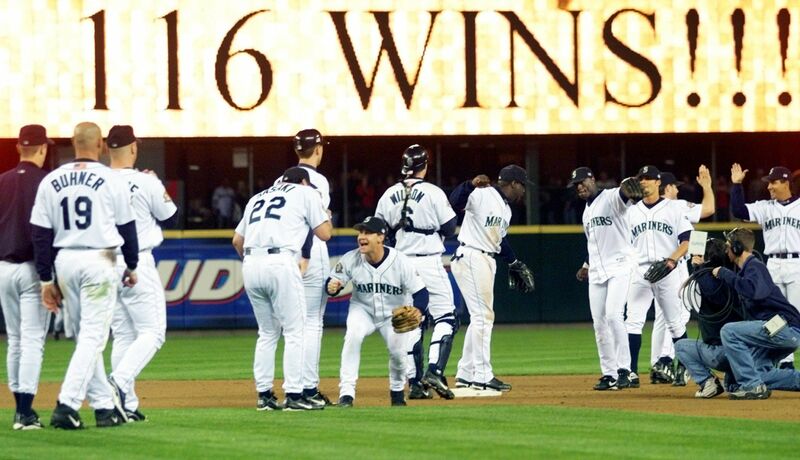 Currently, the Seattle Mariners hold the record for best regular season with 116 wins (the 1906 Chicago Cubs also had 116 wins but they played 10 less games). Just for the sake of argument, let's compare the two lineups. Note: this analysis will not include players the Yankees have either traded away or lost to free agency or retirement. This analysis will be limited to players currently signed by the Yankees and will exclude free agents who have yet to sign a contract. The Yankees starting catcher is power hitter Gary Sanchez. Last season, Sanchez smacked 33 HR, drove in 90 runs and had an OB% of .345. Defensively, the rookie catcher struggled. He allowed 53 WP and a league-leading 16 PB and committed an AL-worst for a catcher 13 errors. Hopefully with time he can learn to tighten things up defensively. Sanchez was a bit better at throwing out runners (38% vs. 23% of runners caught stealing for Wilson). So many factors determine whether a runner is thrown out from pitch selection to how good a jump the runner gets that it's tough to put a lot of weight into this stat. If he doesn't, the Yankees may look to replace him as a starter. Seattle had veteran catcher Dan Wilson behind the plate. While he didn't have the offensive numbers in 2001 that Sanchez had last season, he was more reliable behind the plate, allowing just 3 passed balls and 23 wild pitches. One major advantage Wilson had over Sanchez was 2001 marked Wilson's 7th season with the Mariners whereas Sanchez was in his rookie season. I'm going to give the advantage to Dan Wilson because he was more reliable defensively and I'm not sure how big an improvement we'll see from Gary Sanchez next year. While it is great to have an offensive catcher, to me it is more important for a catcher to minimize the errors and WP/PB as these can lead to extra runs for the opponent. Assuming the Yankees don't sign another free agent, it is likely the Yankees will start the 2018 season with Greg Bird as the starting 1st baseman. In 40 starts at 1st base in 2017, he was perfect defensively. Offensively, he struggled hitting .190 with 9HR and 28RBI. It is difficult to really gauge him as an everyday player because the bulk of his playing time occurred in late August/early September as a call-up from AAA. The Mariners had ex-Blue Jay John Olerud at 1st base. Olerud brought with him the experience of 2 WS with the Blue Jays. He had a solid season overall in 2001 hitting .301 with 21 HR and 95RBI. Defensively, he had a solid .993 fielding% (5th best in the AL) and committed just 9 errors. The experience factor tips the scales here. It is likely that the Yankees will pursue a more veteran option to play first base either through free agency or a trade. At the moment, first base is a potential question mark for the Yankees in 2018. In 2017, the Yankees had Starlin Castro at second base. He's since been traded to the Miami Marlins in the aforementioned Stanton trade. Again, assuming the Yankees don't sign another player or make another trade, one of Ronald Torreyes or Tyler Wade will start at second base. Torreyes is the more veteran option and he had a solid year at the plate in 2017 batting .292 with with 92 hits and 36 RBI's. Wade had limited action appearing in 30 games as a call-up. Seattle had Bret Boone playing 2B in 2001. Boone had the best season of his career in 2001 and was a major reason why the Mariners won 116 games. He batted .331, hit 37 HR and drove in an AL-best 141 runs. In the field, Boone had a near perfect .986 fielding% and committed just 10 errors all season. Seattle had the big advantage at this position. I suspect NY will look to add depth at this position as well. On a side Note, Bret Boone was one of my favorite non-Jay players. Here, the Yankees have a rising star in Didi Gregorius. Heading into his 6th full season in the majors, Gregorius had a solid 2017 campaign. At the plate, he hit .287 with 25 HR and 87 RBI. In the field, Gregorius was equally as solid with a .982 fielding% and just 9 errors. Look for him to play a prominent role for the Yankees in 2018. Seattle also possessed a shortstop comparable in age (Gregorius is 2 years older than Guillen was in 2001 and Gregorius has 5 years as an everyday player whereas Guillen was in his second year as a starting shortstop). The Mariners shortstop chipped in with a .253 average and 53RBI. The Yankees have the edge here given that Gregorius has more upside than Guillen did. Both players contributed to their teams in their own way. Last season, veteran Chase Headley manned the hot corner for the Yankees. He was traded to the San Diego Padres mid-December. If things stay the way they are and the Yankees don't add anymore players, it is likely rookie Miguel Andujar could be the starting 3rd baseman. In very limited action in 2017, Andujar showed a lot of promise. He went 4-7, including 2 doubles (1 of those doubles occurred on the final day of the regular season vs the Blue jays. Andujar split time between AA and AAA. At the AAA level, he hit .317 and drove in 30 runs. It is entirely possible the Yankees will add a 3rd baseman before spring training in a month. Seattle had veteran David Bell playing 3rd base in 2001. Bell, like Andujar, was not a big power hitter. In 2001, David Bell batted .260 while driving in 64 runs. In the field, Bell boasted a .960 fielding% and committed 14 errors. I have to give the Mariners the edge again given the lack of experience the Yankees presently have. I suspect things will change in that respect because it's pretty risky to have a rookie who has just a handful of games experience at the major league level starting at such a key position as 3rd base. 10-year veteran Brett Gardner trolls left field for the New York Yankees. Last season, Gardner hit .264 with 21 HR, 63 RBI and 4 triples. Gardner also brings an element of speed. In 2017, he stole 23 bases and was caught just five times. Defensively, Brett Gardner is as solid as you can get. In 2017 , he had a perfect fielding percentage and committed no errors. The downside is Gardner is get on in years and his numbers are likely to decline in couple seasons, much like what happened to Jose Bautista in Toronto. The Mariners deployed 10 year veteran Al Martin. in 2001, Martin hit .240 with 7 HR and 42 RBI. Al Martin also had a high strikeout rate (he struck out 155 times in 2001 which was 4th worst in the AL. Martin wasn't as effective in the field as Gardner is for the Yankees. In 2001, Martin committed 4 errors. The advantage goes to the Yankees. As a whole, Gardner has had a much more consistent career than Martin did. he has proven to be very reliable and a solid leader in the locker room. Arguably, center field is one of the most important positions on the baseball diamond. The player who plays this position ideally has a lot of speed as they have a lot of ground to cover. Last season, Jacoby Ellsbury was in center field for the Yankees. Recent reports suggest that Ellsbury may be with another team picture in the near future. If Ellsbury is still a Yankee the season, they will have a player who batted .264 in 2017 with 7 HR and 39 RBI. He also stole 22 bases last season and was caught stealing 3 times. Ellsbury proved to be a difficult batter to get out as he struck out 63 times in 2017. Ellsbury had a .985 fielding percentage and committed just a single error all season. If Ellsbury does move on, it is likely the Yankees will go with Aaron Hicks as their 2018 starting center fielder. Hicks batted .267 last season with 15 HR and 59 RBI. He stole 10 bases 5 times. in his 50 games as a center fielder last season, Hicks had a solid .991 Fielding percentage going to bed and committed 1 error. In 2001, winners had key veteran Mike Cameron. Cammy was instrumental in helping the Mariners to the record 116 in 2001. Cameron batted .267 with AHRN 110 RBI like Brett Gardner, he stole 34 bases and was called just five times. Mike Cameron struck out a lot in 2001 (155 times, which was 4th worst in the AL). Mike Cameron was recipient of a gold glove in 2001, thanks to an impressive .986 fielding percentage, committing just six errors and helping turn two double plays. If I had to pick a player out of the three I imagine I would go with Mike Cameron. However one can not be wrong picking any of the three between Aaron Hicks, Mike Cameron and Jacoby Ellsbury. 2001 marked the rookie season for Japanese import Ichiro Suzuki. Ichiro had astronomical numbers in 2001. he had an AL-best .350 batting average and Major League best 242 hits. He also stole a ridiculous 53 bases (also a major league-best ). Suzuki won 5 Awards in 200l: AL batting title , AL Rookie of the Year , Silver Slugger, Gold glove (he had a .982 Fielding percentage, committed just one error and help turn 2 double plays) and AL MVP. What makes Ichiro's 2001 all the more amazing is prior to that season he was playing in the Japanese League and had never faced any of the pitchers before. Suzuki went on to have a very successful career and his numbers were consistent year-to-year. This is another situation where picking either player to play right field would not be the wrong decision. If one is looking more power in the lineup, Aaron Judge would be the choice. if one wants a solid leadoff hitter who will get on base and be a threat to steal but not contribute too much in the way of power, then Ichiro Suzuki would be your man. The New York Yankees might just have the greatest designated hitter in recent time. In mid-December they pulled off trade with the Miami Marlins (who coincidentally are owned by former Yankees shortstop Derek Jeter, not that he had anything do with influencing the trade wink-wink-nudge-nudge) acquiring the reigning NL MVP and reigning NL Hank Aaron Award winner for best hitter. All Stanton did last season was launch an MLB leading 59 HR, drive in a ridiculous 132 runs (another MLB-leading stat) and his slugging percentage was .631! Oh, and should Aaron Judge need a half day off , Stanton is no slouch in the field. Last season, he had a .988 fielding percentage sport and committed 4 errors. Most times, except maybe for the interleague games played in the NL or the odd day when the Yankees want to give Aaron judge a break and make him DH for a game, you'll see Stanton's name in the DH spot. He and Judge might just compete with each other and make each game a mini Home Run Derby. Will Giancarlo Stanton and Aaron Judge combine for 10 home runs in a single game? Will one of these gifted power hitters break Barry Bonds single season home run record? Time will tell. The Seattle Mariners had 38 year old veteran Edgar Martinez as their designated hitter. Martinez also had a solid season in 2001. In fact, in a twist of irony, Martinez won the designated hitter of the Year award, later renamed the Edgar Martinez award after him in 2001. Martinez batted .306 with 23 HR and 116RBI in 2001. Even though Martinez was in the twilight of his career, he was still able to produce solid numbers in the latter part of his career and was a major contributor to the Mariners 2001 team. Without question, the Yankees have a huge advantage at this position, not only because of who will get the bulk of the playing time at designated hitter but who will be the backup designated hitter . The role of the starting pitcher changed since 2001. for instance, there is a lot more emphasis on pitch counts which means that pictures rarely throw more than seven innings. Also, there are more specialized pitchers who are signed to pitch in certain situations or to particular batters. That said, the Yankees 2017 rotation was led by the hard-throwing righty Luis Severino. in 31 starts , Severino had had a 14-6 record, 2.98 ERA, 1.040 WHIP, 230 K and 51 BB . He also 6 WP and hit 6 batters. Other pitchers in the Yankees rotation last season were veteran southpaw CC Sabathia (14-5, 3.69ERA; played with a big knee brace on for most of the season), rookie Jordan Montgomery (9-7, 3.88ERA), trade deadline acquisition Sonny Gray (4-7, 4.07ERA after the trade to the Yankees; one should not put too much weight into the 11 starts he made after the trade - Gray was probably experiencing an adjustment period to new signs and a new catcher), Japanese phenom and Jays killer Masahiro Tanaka (13-12, 4.74 ERA; in his final start of the season against the Jays on September 29th, Tanaka threw a gem. he struck out six of the first nine batters he faced and had a perfect game through 4.2 innings before Ezequiel Carrera hit infield single. Tanaka finished the day with an impressive 15 strikeouts). The Mariners also had a pretty solid rotation in 2001 third-year pitcher Freddy Garcia who had a league AL-best 3.05 ERA, pitched an AL-high 238.2 innings. He allowed an AL-low 0.6 home runs per 9 Innings and struck out 163 batters while walking 69. WHIP was not yet kept track of in 2001 so I will not include this stat in the pitcher's analysis for the Mariners. other starters in the 2001 Mariners rotation included 38 year old veteran Jamie Moyer, who finished with an impressive 20-6 record and 3.43 ERA, righty Aaron Sele (15-5, 3.60ERA), veteran right-hander Paul Abbott (17-4, 4.25ERA), and southpaw John Halama (10-7, 4.73ERA). The Mariners rotation has the edge due to their consistency. Back in 2001, the starter was expected to go 7+ innings; whereas today a 5 or 6 inning start is good and anything more is icing on the cake. The bullpen could be the Yankees greatest strength in 2018. Anchored by flamethrower Aroldis Chapman, control who can throw over 100MPH. In 50 appearances last season, notched 22 saves, a 4-3 record and a 3.22 ERA. the big question for Chapman is control. While Chapman can a baseball really hard he also has a tendency overthrow the ball and miss his target badly. this results in him having to throw extra pitches unnecessarily and he walks more batters than his manager would like. also in the Yankees bullpen are setup men Chad Green (5-0 record and 1.83ERA in 2017 and Dellin Betances (3-6 record, 10 saves and 2.87 ERA in 2017). David Robertson, a mid-2017-season trade acquisition, is a former Yankees closer and, prior to that, he was a setup man to arguably the best closer in the game Mariano Rivera. Should Chapman falter in his role as a closer , look for Robertson or Betances to take over the closer's role. Rounding out the bullpen should be righty Adam Warren (3-2, 2.35ERA in 2017), southpaw Chasen Shreve (4-1, 3.77 ERA in 2017) and veteran righty Tommy Kahnle (1-1, 2.70ERA in 2017). The Mariners also had a pretty solid bullpen 2001, led by closer and fellow Japanese import Kazuhiro Sasaki who notched 45 saves and had a 3.24ERA in 2001. He also possessed an 0-4 record but all that indicates is that the Mariners were unable to come back to at least tie the game when he blew a save. His setup men were Lefty Arthur Rhodes(who enjoyed in an outstanding 2001 season with an 8-0 record and 1.24 ERA), sidewinder Jeff Nelson (4-3, 2.76 ERA in 2001) and righty Jose Paniaqua (4-3, 4.36 ERA in 2001). Rounding out the rest of the bullpen were southpaw Norm Charlton (4-2, 3.02ERA) and veteran right-hander Ryan Franklin (5-1, 3.56ERA). The Yankees bullpen definitely gets the edge here. They have multiple players who can close out games, they have multiple players who can eat innings and they have multiple players who can be trusted most games. Simply put, the Yankees will be very hard to beat when they have the lead 6th inning or later. Can the Yankees match or better the Mariners 116 win season? A lot has to go right for the Yankees to succeed but as one can see from this lengthy analysis, the Yankees possess many of the same strengths the Mariners had in 2001. As a team, the Mariners were more reliant on timely hits and speed on the base paths while the 2018 Yankees are looking very much like the Bronx bombers of past seasons and could easily smash some offensive records. The starting pitching for the Mariners was overall more consistent than what the Yankees have. However, the Yankees have a really strong bullpen with multiple pitchers who can eat innings should the starter be out early either due to injury or ineffectiveness. I am going to stick my next out on this one and predict that the Yankees will beat the Mariners 116 wins. I think they have enough power in their lineup to overcome a weaker starting rotation. I also think that if the Yankees have the lead after 6 innings -- game over.